Welcome to High Peaks Rentals. 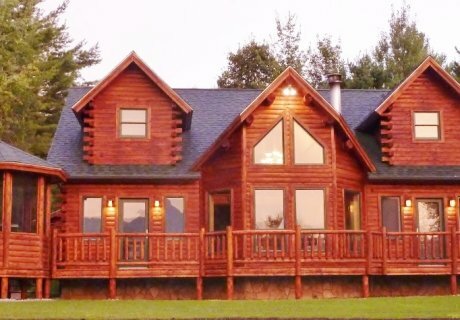 We are proud to offer multiple 4-6 bedroom luxury log homes in the Whiteface and Lake Placid area, with over 300+ 5 star reviews. We can host weddings, multi-family get togethers and and of course quiet "get away from it all" retreats. You can find all our homes by searching online for "HighPeaksRentals". 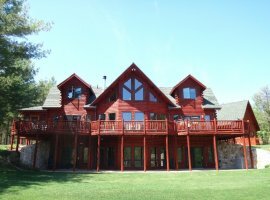 This luxurious log home sits on 5 private acres and provides wonderful views of the Jay Mountain Range. The amazing views can be enjoyed from the patio, gazebo or the deck as well as inside the home through the abundant glass. Bike, walk, hike and cross country ski on the surrounding country side. More extensive activities can be found in the surrounding High Peaks Region. We are only 4 miles from Whiteface Mountain Ski area so you can be on the slopes in minutes. Lake Placid and the Olympic Village are just a 15 mile ride where you can find many shops, restaurants, and activities. There are also plenty of wonderful local restaurants (Keene) and bars (AuSable Forks). Rivers, lakes, and streams can be found in every direction to enjoy boating, fishing, canoeing, or swimming. Back at the house there is plenty of room to relax with over 4000 sq. feet of living space. 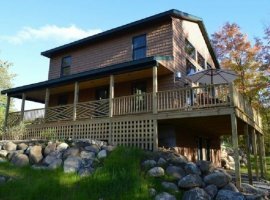 The multi-zone heated and centrally air-conditioned log home features a great room on the main floor with twenty eight foot high ceilings and a full glass front to let in the views. A fireplace with a large stone chimney creates a cozy atmosphere for all the guests. Adjacent to the great room is the dining room with plenty of seating, and a kitchen will all top of the line appliances. The kitchen is fully stocked with all the cookware and settings you need. Also located on the main floor is the master bedroom suite with a king size bed. The master bath has his and hers sinks and a walk-in shower. There is also a half bath on the main floor. Upstairs there are three bedrooms - 1st bedroom has a queen bed and a day bed with trundle, 2nd bedroom has a queen bed, and the 3rd bedroom also has a queen bed. The second floor also has a full bathroom and a loft area with a guest PC. Additionally, there is a laundry/mud room off the kitchen. The walk-out lower level has two large bedrooms, two full baths, large recreation area with a ping pong table, TV media center with Xbox w/games, and an additional laundry room. 1st bedroom has a king bed and the 2nd bedroom has two of twin over full w/twin trundle bunk beds. The rec room common space has 2 futons for additional guests. There is also a 2 car oversized parking garage available for guest use. Further, the outside also features a BBQ on the deck as well as fire pit for those late starry nights. Lastly, there is a 7 person Hot Tub and 8 person Sauna situated over a flagstone patio under the stars!! 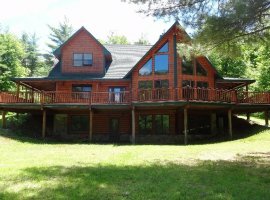 We had a wonderful time in this wonderful secluded ADK luxury lodge. Top of the line amenities combined with gorgeous nature surroundings... what else can you ask for? Owner Gene is super easy to work with and is extremely responsive. We can't wait to return!!!! Grand Jay Lodge was the perfect place for a weekend with friends. We celebrated a 40th birthday in Adirondack style booking this lodge. The views are great. The drive to town is quick and also gorgeous. We hiked Round Mountain, hit some local breweries and came back to relax at the lodge. We enjoyed all the outdoor amenities (fire pit, hot tub, sauna) as well as the open floor plan and game room. We'll definitely consider coming back in the future! Everything matched the description. It was clean, orderly and in very good condition. The refrigerator was clean. All of the light switches were labeled. The WIFI was easy to connect to. Bathrooms and showers were very clean. Plenty of towels and easy to find. 17 of us every year do our annual weekend away in the Adirondacks. This house far surpassed our expectations. There was enough room for all of us and the house never felt crowded. The outside space with the HUGE hot tub and amazing sauna created many nights under the stars. The owner had everything there from firewood to kitchen supplies. Gene was a pleasure to work with even with some of my many (probably annoying) questions! He was a text away for any concerns. Thank you Gene! Our group thoroughly enjoyed our weekend and we watched the full Moon rise over the peak of the mountain in the backyard. I cant tell you how incredible it was! House was within 15/20 min of all of Lake Placid! We look forward to coming again and want to thank Gene for making the experience so wonderful!! Fantastic house in a beautiful location! We rented Grand Jay, Grand Meadows, Grand Pines, and Ebs View lodges from Gene in September 2018 to host our wedding and many of our guests. The whole experience was fantastic! Gene's properties were the perfect way to welcome our friends and family to the Adirondacks and were the best possible backdrop for our wedding. All of our guests had everything they needed to have a fun and relaxing weekend of hiking, exploring Lake Placid, and celebrating. Grand Jay has an incredible view which we enjoyed all weekend. We would definitely rent any of Gene's properties again next time we are in Lake Placid and highly recommend them to anyone visiting the area! We really enjoyed our stay at the amazing Grand Jay Lodge! It was very comfortable and there was plenty of room for everyone both inside and outside. The downstairs game room was very popular with the kids. Outside in the yard, the whole family enjoyed baseball games, toasting marshmallows over the fire pit and relaxing in the hot tub.The house had everything we needed and the owner was very considerate and responsive. It was a beautiful and memorable vacation! Loved the house, great location and exactly what our family needed. Owner accommodating and not over bearing like some owners, process simple and fast. Kids especially liked hot tub and big room downstairs. Adults loved fire pit and big kitchen. Clean and comfortable house, will rent from Gene again. Beautiful open concept, very clean, great attention to detail! We rented the house to stay for a family vacation. There were 5 couples and 3 kids. The property was more than spacious and very well maintained. We really enjoyed the open concept kitchen, living and dining room. The house had absolutely everything we needed. The drive into town took about 20 minutes and was very easy. We can't wait to book our next stay! Very pretty on the surface, needs some work. Some stains on the carpet when we arrived. Wasn't too upset about it until I got a text from host asking me if I knew where the stains came from. Since we rent from vrbo often and every house is not perfect I accept them as they are unless there are huge problems. Therefore I was put off when asked if I knew where the stains came from. I had to make several inquires to different families just to find out all the stains were already there. As this is the first time this has ever happened, I am disappointed in this host.The location is very nice. House was very nice, clean comfortable, modern and sleeps a lot of folks comfortably. Before arriving, I was worried that it was a bit too far outside downtown Lake Placid (about 20m drive). But the drive into town is very scenic with trailheads, lakes, etc. all along it. So it's a fun ride and provides many opportunities to explore. Didn't feel like a hassle at all. Would definitely stay again.